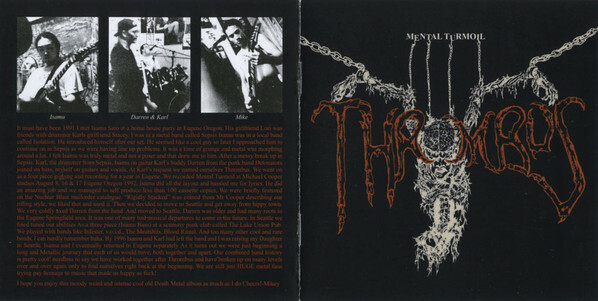 Unearthing a semi-lost / semi-forgotten death metal release from the genre’s golden age is always a wonderful thing……which brings us neatly to Thrombus‘ 1993 demo Mental Turmoil, a 6 track album (more of an EP really) which has remained lost to the annals of time, until La Caverna Records saw fit to unleash it on the world once again! Now officially reissued on CD, Thrombus’ tape from 1993 was originally self released with just 100 copies produced and you could be more than forgiven for never knowing of its existence. Which would be a shame, as these deathly American’s held considerable promise! A flawed – yet interesting – footnote, Mental Turmoil was home to future members of Yob, Aldebaran, Shadow of the Torturer & Omnihility and their youthful pedigree is writ large over the course of 6 tracks of well-constructed, well-executed, old school death metal in the vein of Autopsy, Cause Of Death-era Obituary and God Macabre. Nip over to Thrombus’ bandcamp page and grab a copy!